Is delivery faster and more convenient than ordering McDonald’s at a drive-thru? 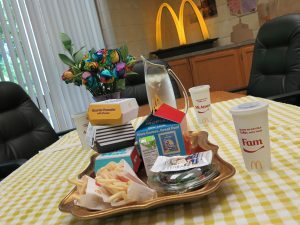 We tested McDonald’s new delivery partnership with UberEATS to see how the fast-food giant’s sandwiches, fries, Happy Meals and “artisan” burgers weathered the journey to our office with a delivery service, rather than just driving down the road to get it ourselves. “This is going to be the most convenient meal of my life,” I thought before asking my fellow editors what they wanted for lunch. Initial reactions ranged from “meh” to “oh yeah!” at the prospect of a company-paid meal, as well as the chance to try the much-hyped McDonald’s Signature Crafted burgers. With McDonald’s famously pioneering the “just in time” food production that swept the globe decades ago, stakes are high as the Golden Arches embrace this generation’s earth-shaking restaurant trend—on-demand delivery. 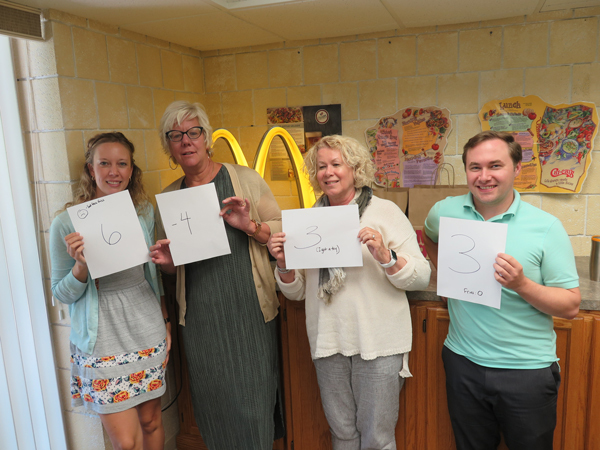 The nearest McDonald’s is a scant six-minute drive from our office, so everyone jumped onto the order hoping the quick drive would ensure fries arrived crispy and sandwiches showed up clinging onto signs of vitality. I opened Facebook to check out its new “order food” capability that had shown our neighborhood McDonald’s last week. Seven days later, no restaurants were listed in our ZIP code—or for the entire city of Minneapolis. Perhaps Facebook’s delivery trial isn’t going so well, or the site was temporarily buggy. Moving on, I opened the UberEATS app on my phone, pecked in the order and scheduled it for 12 o’clock—two hours into the future. As soon as I clicked “order” the brilliant idea of ordering an ice cream treat on this 90-degree summer day flashed into my mind. Next time, next time… Placing the order on my phone was no trouble, although I noted it was more tedious than barking into a microphone from my driver’s seat. Once the order was placed, I opened an UberEATS tab in Chrome to monitor the order, which was quoted to arrive at 12:08—not bad. As 12 o’clock drew nearer, I noticed the quoted time shifting, first, to 12:09, then 12:14 and—only a few minutes later—12:23. My phone rang at 12:03, our UberEATS driver Mohammad was lost and sounded a bit frantic. He asked, “What’s the address? What city?” I repeated my address, noting that it wasn’t the most professional interaction. At 12:08, the site announced “Food is arriving. Time to eat!” I checked the map to track our driver, but it was clear Mohammad was still lost as the icon looped around an adjacent neighborhood. He called back two minutes later asking for the address again, and sounding a step or two more frantic than before. I began losing my patience as I laid down a tablecloth and set out the essentials for a classy, hopefully still-tasty meal in our conference room. Dinner parties can be so stressful. Ten minutes later, at 12:20, I saw Mohammad’s SUV pull into our parking lot. I ran outside and thanked him as I ushered him in. He was friendly, apologized for the delay and said I didn’t put in the address when I ordered. Being a passive Minnesotan, I replied “Oh, gosh, I’m sorry,” mentally noting that I did indeed enter the address and even double-checked it. Did you know “Minnesota nice” is just a synonym for “passive aggressive”? Sitting down before our spread, Contributing Editor Beth Ewen was immediately skeptical, noting the translucent, post-mortem look of the fries that had clearly lost their luster. Editor Nancy Weingartner was downright bubbly as she unpacked her Happy Meal, which included a Despicable Me toy, apple slices, small fries, cheeseburger and apple juice box. She did note, however, that her fries and apple slices were the same color, and complained about ketchup she didn’t order on her hamburger. Fellow editors Laura Michaels and Nick Upton noted the zombie fries, but gave favorable initial marks to their Big Mac and Crafted Quarter Pounder combos, respectively. My Signature Crafted Crispy Chicken sandwich was little more than a standard fried chicken sandwich with soggy bread due to the pico de gallo and overly generous dollops of mayo and guacamole. I discovered that guacamole and wet bread have an eerily similar texture. A mini salad, in lieu of fries, survived the journey much better, with no wilted leaves or deflated tomatoes. 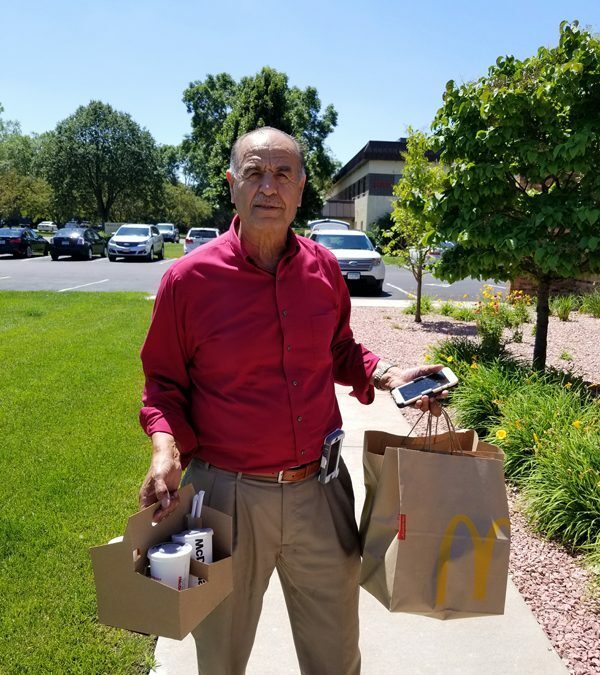 Reflecting on many previous third-party delivery experiences, our snarky editors noted McDonald’s delivery packaging—cardboard sandwich boxes and paper bags—was no different than the standard fare. Without investing R&D into better packaging, it’s hard to figure how McDonald’s will ever capture market share from local and national chains that put the time, money and effort into delivery-specific packaging that better insulates their food from the rigors of the road. Michaels was the most pleased with her gussied-up Quarter Pounder, proclaiming her love for the dijon, but bummed about the lifeless beef. Upton felt his Big Mac was typically Big Mac-like, no surprises good or bad. As the chewing began to subside, Weingartner was still taken with her toy and was delighted to share apple slices—a happy camper, indeed. Ewen was the other side of the coin, despondent in the wake of her disappointing, literally lukewarm lunch. Knowing so many restaurants are leery of delivery, wondering who customers will fault for a bad delivered experience, I asked Ewen who she blamed for her lackluster lunch. Reflecting on it all—including the often thankless task of party host—there’s a parallel with our delivery experience and the maxim that “You get what you pay for.” We’re big fans of shortcuts to good food, but ordering delivered McDonald’s won’t be on our lunchtime to-do list anytime soon. While the company’s delivery is still in beta, we strongly recommend McDonald’s invests serious R&D into its packaging, which is simply not good enough for delivery. From our experience, slower and colder fast-food isn’t going to please anybody.